The two most famous guns from the American 20th Century, the Colt 1911 and the Tommy Gun, both used .45 ACP ammunition. While it's easy to romanticize the reason being as a product of tough guys wanting to hammer away at everyone in front of them with as big a bullet as possible, the real reason is a more complex. Truly though, if over simplified, it really does come down to tough guys wanting banging ballistics! The Philippine-American War and World War I made soldiers and munitions experts alike realize one thing. Close quarters combat -- trench warfare in their case -- required a weapon do two things in order to increase a soldier's odds of success: fire rounds in rapid succession and fire rounds that had serious knockdown power. The Thompson Submachine Gun did both and that's why it was given nicknames like the "Trench Broom" and the "Trench Sweeper." 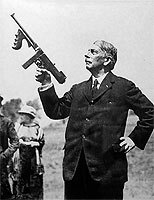 General John T. Thompson got serious about developing a submachine gun in 1915. He retired from the Army and began looking for backers to finance the development of his idea: an automatic weapon that didn't require a recoil or gas operated firing/reloading mechanism. Thompson developed a friction-delayed blowback action for a rifle. The Tommy Gun can accommodate a 60 round barrel magazine or a 30 round straight magazine and can fire between 600 and 700 rounds a minute. It was originally manufactured by the Auto Ordnance Corporation and cost $200 at a time when a new Ford vehicle could be purchased for $400. The cost of the Tommy Gun meant that it was rarely purchased in high volume. As a result, the Auto Ordnance Corp. sold the firearm to any and all takers. The U.S. Marines used the weapon in Nicaragua, constabulary forces in Central and South America used the weapon, the Irish Republic purchased Tommy Guns for both the Irish War of Independence and the Irish Civil War and -- of course -- gangsters smuggling alcohol during prohibition made purchases. Funny Fact: The Auto Ordnance Corp. allowed buyers to purchase the Tommy Gun through mail order. Though World War I ended before the Tommy Gun was complete, by the Second World War it was a tried and true firearm. The United States Government purchased Tommy Guns for commando units, paratroopers and Ranger battalions... any soldiers that could expect to be fighting in close quarters. The Thompson Machine Gun saw action in the Korean War and then again in the Vietnam War, particularly in bunkers and tunnels. 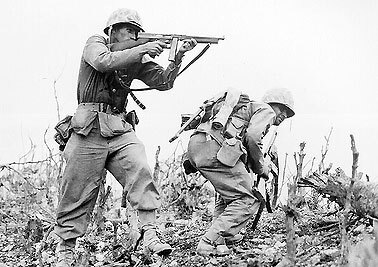 Again, the lethal knockdown power of the Tommy Gun as well as it's rapid firing potential made it invaluable, though eventually the U.S. Army replaced it with the M16. Today the Tommy Gun is a collector's item that brings anywhere from $1,000 to $2,000, depending on the condition.